Sign up for our FREE SingleSync club membership and our weekly E-mail newsletter ! All parties are open to members and first-time guests. Want One for Your Business or Organization? Do You Own a Restaurant, Bar or Other Party Venue? Unless otherwise noted, all parties are open to members and first-time guests. These include all "Gourmet Connections," "Mission Martini," "Why Knot? Singles and "Chicago Singles Mixers" events. Membership in SingleSync is entirely FREE to all single adults in the Chicago area. To make a reservation RSVP to any club events, please press the "Submit RSVP" button below, and complete the RSVP E-mail. Indicate which event you wish to attend, and if you are bringing a guest and his or her name (Note: most people attend by themselves. It’s fine to bring a guest, but they are certainly not required). For some events, you will be asked to pay in advance and provided instructions to do so. For most events, however, you will simply be asked to RSVP in advance and then asked to pay a party organizing and administration fee (usually $7 to $14 in cash when you arrive at the party). You generally pay for your own drinks and food at our events. If you RSVP for an event and are a “no-show,” your absence will be noted. Multiple “no-shows” will result in penalties, including expulsion from the club. Our reputation with restaurants and the quality of our events depend on having members who are committed and who keep their word. On Friday, April 26, we are hosting our third Singles Happy Hour. This fun get-together for active singles (mainly 40s through 60s, but who is counting?) is a Happy Hour Gathering at one of the most popular bar/restaurants in the western suburbs. 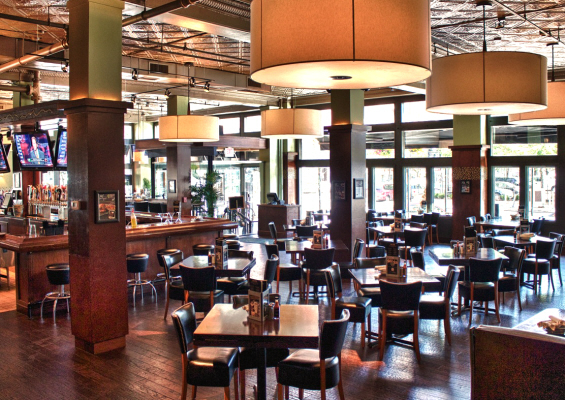 *Bar Louie * in Oakbrook Terrace is noted for its terrific happy hour offerings. Our past happy hours have drawn excellent crowds. The *Bar Louie* for our get-acquainted happy hour is located on 22nd Street, a mile west of Route 83 and the Oakbrook Mall. It is on the ground floor of the Holiday Inn, across the street from Costco. We have reserved several tables for our gathering. There you can mix and mingle with lots of other singles, talking with and getting to know one another. The primary purpose of our club is to help singles to develop all kinds of relationships, starting with "friends-first." What better way to do this than to join us for a casual a get-acquainted happy hour and mixer, with lots of drink and appetizer specials in a terrific venue. When? - Friday, April 26, 5:00 – 8:00 p.m.
Join SingleSync for a lively cocktail mixer and happy hour gathering at the popular after-work or shopping gathering place, *Bar Louie*. This inviting bar and restaurant makes a welcoming venue to meet and mingle with other singles. Arrive early to enjoy plenty of drink, wine and craft beer specials, along with some tasty appetizers at great happy hour prices. Meet, converse with and get to know single friends familiar and new in very pleasing and contemporary surroundings for casual mingling, friendship and fun. To join the party, you need only to RSVP in advance (so we know you are coming and can properly plan the party) and pay the $5 registration party fee at the door. You pay for your own drinks and appetizers. To register in advance, RSVP BELOW by 2:00 p.m. that Friday. “No Shows” who reserve a place but do not cancel in advance or take part in the party will be noted. Multiple “no shows” will result in penalties, up to and including exclusion from any further participation in this group. Our club values commitment and courtesy. Casual attire. There is lots of parking in the hotel lot, next to and behind the building. So, warm up your late April weekend and celebrate the fact that spring is finally here. Get to know other singles while enjoying drink and appetizer specials in a welcoming, contemporary atmosphere. Share plenty of conversation and camaraderie at *Bar Louie* and make some new single friends in the process. Isn't that what spring is for? We hope that you can make it because the party just wouldn't be the same without you. To Your Great Single Life! Below is my RSVP reservation commitment for this party! Thank you, and please let us know in advance if for whatever reason you need to cancel. Singles Notebook is © copyright 2015 by James Senhauser All Rights Reserved.